Process planning involves creating detailed plans of the manufacturing steps and equipment necessary to produce a finished part. Using the variant method, CAPP groups families of parts by a structured classification and coding plan. This report summarizes the state–of–the–art and future trends in the area of CAPP. The computer is a vital part of the process planning function, which includes two different approaches. One is called the variant (similar part) method of process planning and the other is generative (expert system–based). Both will produce similar process plans. Most computer applications, however, are of the variant type, because the software is easier to develop and new process plans are based on previous ones. Intro. Systems organization. CAPP and GT. System implementation. Developing the process plan. 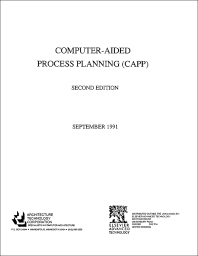 Selecting and implementing a CAPP system. Cost justification. Manufacturing interfaces. A distributed hierarchical architecture. An integrated scheduling system. Applications. Machine cylindrical metal parts. Printed circuit board assembly. The route generator. Vendors. Bibliography.